Something Old and New, Borrowed and... GREEN! : Will you sign my... bench? b) Amazing keepsake, functional and sentimental! c) It's unique. 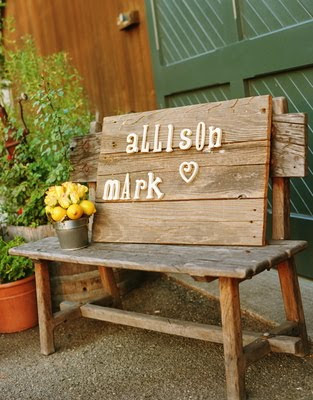 Betcha most people have never signed a bench at a wedding! It would be fun to make design plans and deciding where we would want the bench once the wedding is over. It could be a neat hallway piece in the house (what a conversation starter!) or a cute little spot to sit together in the evenings outside. And look... tons of info on the web for how-to's! OR... You could even find a run down bench at a thrift store or antique store and spruce it up... It might end up being cheaper since wood and supplies add up! Plus, recycle, reuse... whats the other R? Reduce? "Go Green" effort for the green wedding? boom. Andi youre a genius! Me likes.